To understand the side effects of antacids ( Tums, Pepsid AC, Zantac ) and acid blocking medications (Nexium, Prevacid, Prilosec) it is necessary to examine how they work. Antacids neutralize the acids (diminish their effects) that should be in your stomach while acid blocking medications work by suppressing your body’s natural secretion of hydrochloric acid (HCL). The overall effect is that hydrochloric acid (HCL) is rendered ineffective. *Remember the reason why the stomach is designed to be so highly acidic is to break down your food so that when it passes into your intestines it can then be absorbed. If this doesn't happen, your body is now setup to experience a whole host of issues in the stomach, intestines & colon from your undigested meal. Despite temporarily reducing your pain neither drug addresses the underlying cause of why you're having heartburn or GERD. 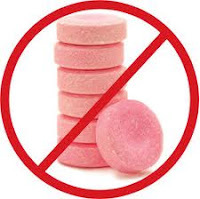 If you check closely, you'll see that most antacids include a disclaimer that they should not be used for longer than 14 days and acid blocking medications are to be discontinued after 8 weeks. There are good reasons for this. When stomach acid is neutralized or reduced the body experiences a decline in health due to mal-absorption of nutrients. This is not something you'll immediately feel or know, but over time your body will suffer the effects of not being nourished. Low stomach acid impairs the body’s ability to absorb calcium, iron, magnesium, selenium, zinc, folic acid, vitamins A, B1, B6, B12 and E. In addition, it weakens the anti-microbial action of the stomach which normally kills food born bacteria and fungi. Antacids: constipation, frequent, difficult or painful urination, frequent urge to urinate, headache, loss of appetite, mood or mental changes, muscle pain or twitching, nausea, nervousness, unpleasant taste, tiredness, weakness, dizziness, light-headedness, irregular heart-beat, undesired weight loss, swelling of feet or lower legs, stomach cramps, bone pain, swelling of wrists or ankles. Acid Blocking Medication: anemia, anxiety, diarrhea, skin rash, itching, abdominal or stomach pain, increased or decreased appetite, joint pain, nausea, vomiting, cold or flu-like symptoms, constipation, increased cough, mental depression, muscle pain, rectal bleeding, unusual bleeding or bruising, headache, increased or decreased urination, increased sweating, loss of hair, ringing or buzzing in ears, runny nose. One of the first things you can do is to change your eating habits. Eating refined carbohydrates, and processed foods exacerbate the problem. Eat foods foods in their whole state & choose organic meats whenever possible. Secondly, it's important to have enough B1(Thiamine) & Zinc in your diet as these are absolutely essential for HCL production. Add 2 tablespoons of apple cider vinegar to 4 ounces of water & drink this before each meal. If you experience any symptoms from this, it's time for a thorough nutritional evaluation with me. Your digestive system is at the core of your physical well being & health. Every part of your body is affected by what you eat and how your digestive system absorbs nutrients. This is quite literally how your body rebuilds itself. So you truly are what you eat!